There is a concern among the forensic science and law enforcement communities that the technology and tactics presented in these shows have lead to unrealistic expectations about police capabilities among the public at large and, even worse, potential jurors. The "CSI effect" is a term applied to the increasingly pervasive idea that criminal cases can be wrapped up in an hour and that there is always incontrovertible proof of guilt available. While it's true that great advances have been made in the area of forensic science, it's unrealistic to expect a crime scene to be processed, evidence analyzed and a conclusive forensics report to be completed before the detective or criminal investigator assigned to the case gets back to the office after leaving the scene. Unfortunately, though, that is what many victims expect, and what a lot of juries now look for. When they don't see it, defense attorneys often exploit the lack of DNA or other smoking gun evidence in an effort to make it appear as though law enforcement investigators didn't do their job. Usually, though, nothing could be further from the truth. Instead, crime scene investigations and scene processing take hours, and sometimes days, if done correctly in order to avoid contamination. After the evidence is gathered, it's usually brought to a secure temporary storage facility to be logged and tracked before it is sent to the appropriate laboratory. This process alone will usually take days, not hours, as meticulous records must be kept and strict rules of evidence must be followed. The idea that crime scene investigators collect evidence at a scene, bring it directly to a lab and either jump on a microscope to analyze it themselves or ask their lab tech buddy to "do me a favor and get that to me by the end of the day" simply doesn't happen. 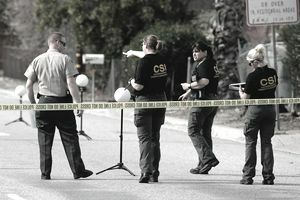 In fact, depending on the department or the crime, many forensic science technicians don't respond to the scene at all. Some very specialized technicians, such as bloodstain pattern analysts, may respond to the scene and collect their own evidence. Most forensic science technicians, though, analyze evidence collected by police detectives or police officers. Once the evidence makes its way to the lab, quite often it sits and waits some more. Crime laboratories across the country have huge backlogs. Most evidence will take a month or more to process. Some evidence, like DNA, can take a year or longer. The fact is, there are too many cases and not enough resources. When investigators place a "rush" request on evidence, they might get results back in a week or two, if they are lucky. CSI fans will also be disappointed to learn that there are no bells and whistles or alarms that go off when a forensic ballistics technician finds a match or a DNA profile is connected to a crime scene. No picture shows up on the computer screen, and no computer software exists to unequivocally declare that "Colonel Mustard used the revolver in the study." Instead, after the analysis is completed, all that's displayed is a code or series of codes to be entered into another database to search for a match. In the case of DNA and fingerprints, matches can only be located if there is already data on file. No comprehensive database exists containing the DNA profiles of everyone in the country. In fact, little more than 3 percent of the population has DNA profiles on file. The numbers of fingerprint records are significantly larger, but still nowhere near the numbers required to replicate the speed and efficiency of identifying suspects that is portrayed on television. Typically, in order to perform an analysis, investigators must already have a suspect in mind and request a DNA or fingerprint sample from him. This is sometimes easier said than done, because taking DNA is considered a seizure, with all of the Fourth Amendment protections that go with it. If a subject refuses to provide a sample, a search warrant will be required. Analyzing the evidence is one thing. Properly applying it is something else entirely. Contrary to popular belief and what has been portrayed on television, there is rarely a single "smoking gun" that proves guilt. Instead, cases are built and convictions won based on several pieces of evidence and testimony that come together to show guilt beyond a reasonable doubt. To do this, detectives must take the findings of forensic technicians and look at them as one piece of a much larger puzzle. The only thing DNA or fingerprints can really tell an investigator is that, at some point, a suspect was at the crime scene. This doesn't mean he committed the crime, or that he was even necessarily present at the time the crime was committed. Solving crimes, especially complex ones, takes a tremendous amount of teamwork and patience. A proper and thorough investigation will often take months or longer before a suspect is identified and arrested, and years before they are tried and convicted. While this may appear to be a far more tedious process than what has been portrayed in popular culture, it's necessary to ensure that justice is dispensed properly and fairly. This should in no way diminish the interest in a forensic science career or other criminology career, though. In fact, an argument could be made that if investigations were as easy as they appear on television, they'd be far less interesting and intellectually stimulating than they actually are.